UPDATE: Uploaded new source and binaries that fix an issue some people had with cellular data. The links below represent the new files. Many were very sad when google chose not to update Nexus 4 to Android 6.0 Marshmallow. 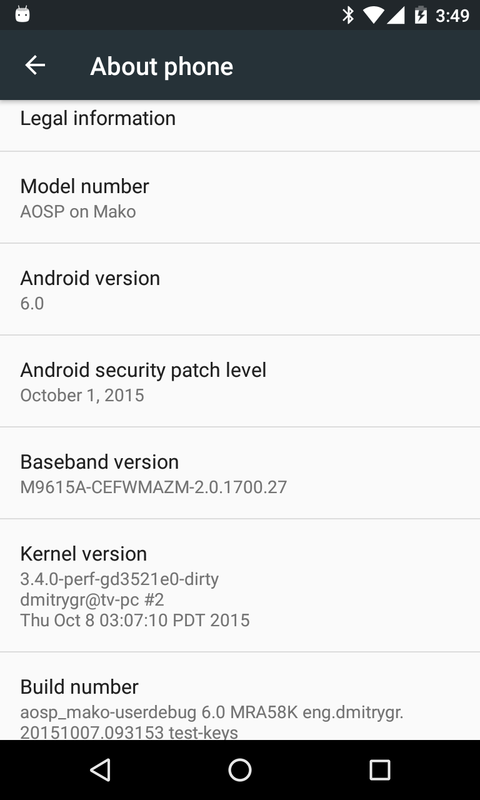 This simple guide will show you how to build Android 6.0 Marshamllow for Nexus 4. You'll be amazed how simple it is. And for the lazy, I also have a pre-built AOSP Marshmallow image set to download on the bottom of this page. Also, LTE works in this set of images :) Since Nexus 4 was originally a Google-Play-equipped device, you can legally install Google Apps on this image and enjoy a full Google Android 6.0 experience on your Nexus 4. That part, however, is up to you to do yourself. I am not offering GApps downloads here. Plase do not re-host this elsewhere and claim them as your work.